There’s a sense in some fantasy campaign settings of being entirely encased in amber, and with good reason: players want the world to remain familiar and useful for play. 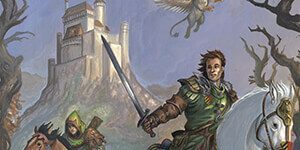 Removing dragons from Dragonlance or advancing a timeline 100 years in a world of your own invention without consulting your game group… well, you would be taking rather a big chance. Change can be a dirty world in the relatively serene halls of fantasy worldbuilding. No one likes a jarring upset of an enjoyable apple cart. At the same time, Midgard’s original design went out of its way to stack up conflicts, arrange ley lines to judder and rasp against one another, prepare armies to march and burn. The potential for risk and disaster was a real part of the appeal of the original setting 5 years ago. And it seems both foolish and unfair to pretend that those kingdoms and disasters are going to remain just… about… to… topple—but not quite!—for ever more. The place was built to explode. Revising it means that some questions rise to the surface. Elsewhere, have goblin tribes found anything to unite themselves in the Wasted West? Surely, the priests of the Black Goat of the Woods might find fertile ground in the charred stones of the magocracy, sharing the Goat’s milk and succor with those who live on little hope but the dream of conquering a dwarven hall or burning down a green forest… and what has the Master of Demon Mountain done in a few years of scheming and grand experimentations? While great tribes and dark gods are always able to shake the levers of the world, even small realms change in interesting ways. Surely, every Midgard player knows that the shadow fey returned to Zobeck and asserted their claim to the place. Heroes made sure that claim was not uncontested, but… even a free city on a small but vital river may have changed a bit in a decade. It hasn’t change much—at its heart, Zobeck is still a regional power at best, a mercantile place built on silver, tin, and relentless devotion to a strange goddess and a ghetto full of hardworking kobolds. But it has changed a little bit. What I am saying is that worlds become more interesting over time with the work of many minds and rich veins of gameplay, daydreams, outrageous characters streaking across the sky, and strange new lands and their ambassadors. It would be a shame, I think, to change Midgard into something so different that no one can say “Oh, I really don’t know the setting anymore.” At the same time, it would be an even greater shame to pretend that Midgard hasn’t changed at all. Like a child growing into an adult, it has become more like itself: its heroes and villains, its uniquely weird magic and dark overtones are so much easier to see with the benefit of five years hindsight and five years further game play than they were in the early days of publishing Midgard adventures and source books. I feel confident you’ll recognize the place, and at the same time, I hope that the other designers and I surprise you more than once with the world it has grown into. The branches of the world tree Yggdrasil are exactly the same, but the shadows you find under its leaves are ever shifting. Thanks for taking the journey to the mortal world and seeing what strange new delights the world holds in store. I cannot wait to start sharing them with you, as the Midgard: Dark Roads & Deep Magic Kickstarter wraps up at noon on Friday, February 24. DESIGNER PROMISE: First seven comments or questions here get a reply direct from me and my new friend Ratatosk. Bring seeds and nuts. Having been raised in a small town then to have “seen the world”, I was impressed by your mention of how even the less notable places are changed by time. I could not agree more as I have seen what ten years impact small towns from economic or political changes as well as those that go off to see what is beyond the town limits and come back to tell their tales. It’s one of the tropes of fantasy that many of the heroes are farm boys and shepherd girls. Even back when, going to see the city was a thing. Of course, a kobold warren with a thriving population has almost as many inhabitants as a human village. Midgard has (gulp) entire kobold cities in that Dragon Empire. Strange things going on there, surely, turning a humble cozy warren into…. 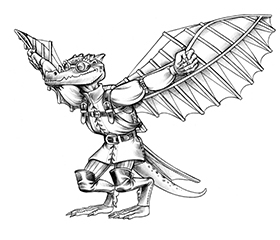 A kobold arcology, a vast compilation of scaly wonders. City life is strange and terrifying, even kobolds long for homey little burrows. I am a neophyte to the world of Midgard, but applaud your evolving story line premise. Change is good and brings about some interesting story twists in my experience. I am a proud supporter of the this Kickstarter as well as Tomb of Beasts and DC&SS. My question is in regards to further 5e products for Midgard. Will there be more new 5e products/updating of old products to 5e forthcoming in the future? Most excellent question, Cungr Vanck! And yes, the sage squirrel-like Ratatosk knows much of future releases. 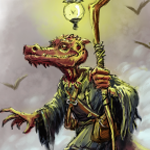 Currently, word on Yggdrasil is that at least 3 unannounced standalone 5E adventures plus 1 unannounced collection of 5E adventures are in the works in the Kobold Text Mines. We have a lot of Midgard support planned for this year and next and the next! I’m looking to pledge soon on that kickstarter campaign. I wonder though how far ahead is the stretch goal of doing Khandiria and Beldestan? Been incredibly curious to know of the wider world of Midgard since the release of the first campaign setting book. That stretch goal is around $200K. The project might get there, but if not, we’ll be well on our way to a Khandiria and the Gateway to the East sourcebook as a standalone release. I’m leery of metaplot. At the same time, I’m busy embracing it for my 2ED Al-Qadim campaign. I know Migdard’s gonna be amazing; it always has been. Yes, I’m conflicted here. How much of the time shift was your idea, and how much of it was from the other designers? It’s pretty much entirely at my urging to advance the timeline rather than stagnate entirely. Other designers have contributed elements to the nudge into the future, and I think for every conflict that has changed some element of the world, we’re setting up new lines of tension, new interesting characters, etc. So, credit or blame to me for insisting on some advance of events; I’ve always been pretty clear that Midgard is a maelstrom, not an iceberg. I think where we’re going is a much stronger setting, richer and clearer in its story and locations. But I fully expect people to object to something, just because change is hard. My wife and I are REALLY enjoying the Midgard setting.